When is the last time you REALLY decorated for Thanksgiving? If you’re like most people, you probably just put up your Christmas decorations a little early to show off to your family. After all, Thanksgiving decorations would be too expensive, right? Well, we’ve got a better alternative, as we’ve rounded up a collection of decorations you can make at home with your printer and a little craftiness. 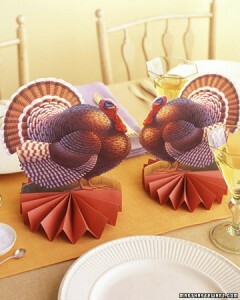 So save some money, take on a few fun projects, and get ready for Turkey Day! If you’re welcoming family and friends into your home, why not spice up an entryway or a fireplace with a banner that reminds everyone of the season of gratitude? 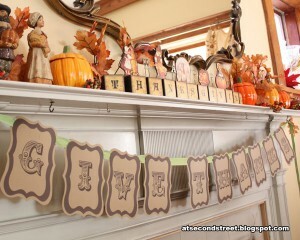 The At Second Street blog provides the templates and the steps so that you can easily make your own “Give Thanks” banner. Buy some ribbon and some specialty paper in your favorite color, and get started. Find the templates for the individual letters on their blog page, cut the letters to shape, then string them together with ribbon for a beautiful finished product. We also love these printable quotes shared by TaketheSidestreet.com. Remind your guests that “Gratitude is the memory of the heart” by printing and hanging them throughout the house in different fall colors. Splurge a little on some card stock or heavy paper and they could last you for several years! Let’s be honest, the place we REALLY want to be spending our time on Thanksgiving is at the dinner table! This project for Turkey Centerpieces from the Martha Stewart site can act as centerpieces or place cards for your guests, dressing up the table with a little extra Thanksgiving theming. All you will need is some orange art or construction paper, then print out the templates for either the place cards or centerpieces and assemble. If you like the idea of place cards for each guest, we have a few other variations for you to try. Print these elegant place cards from Whatever Dee Dee Wants, and then handwrite your guests’ names for a personal touch. If you prefer things a little more fun than elegant, these cute pumpkin place card templates may be right up your alley. Print and fold them, add a bit of green pipe cleaner for a little decorative touch, and you may just find that your guests take them along as a souvenir of your memorable meal! Although it’s tempting to just put your Christmas decorations up early, adding a few Thanksgiving decorations to your collection can spice up your family celebration. With these simple projects, you can impress your guests without spending a lot, and if they are carefully stored, you can use them again next year.